We had the most amazing Christmas Eve. I was excited to take Franco to see the holiday decorations in San Francisco. Since I work downtown, I get to see this winter wonderland all the time. But it’s so different when you have a kid. While driving into the city, up to the top of Nob Hill, Franco commented, “We’re high!” Tell me about it. Some of these hills are barely walkable! 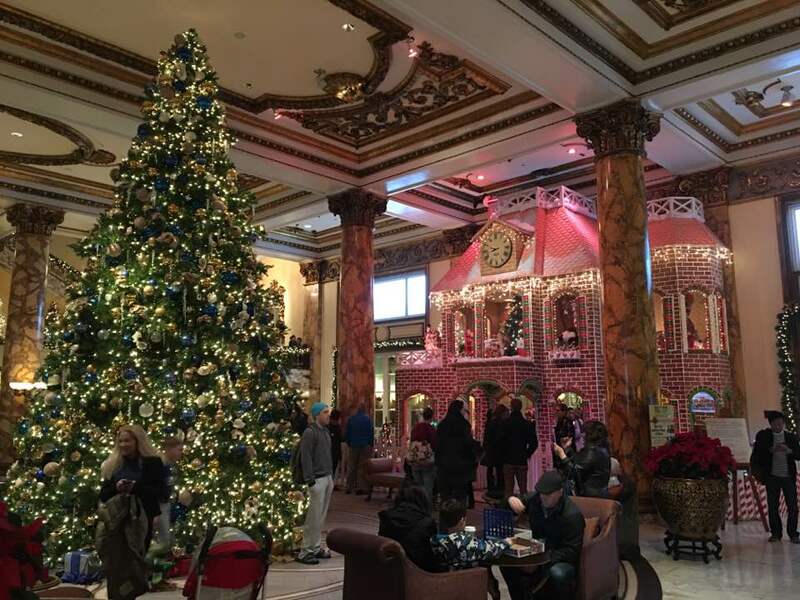 This edible 2-story gingerbread house is in the lobby of the Fairmont Hotel. It includes a train that zips along a track. I thought Franco would get a kick out of it, but it was rather underwhelming. And totally crowded! We indulged in a buffet brunch at the hotel which was pretty good. I stuffed myself with sliced tomatoes, cream cheese, salmon, capers and onions. Yum! There were tons of families there with so many kids that there wasn’t a high chair available for Franco. Well the kid almost pooped in his pants, the cable car ride was so thrilling. “It’s so fast, mommy!” HE LOVED IT. On Market Street, while waiting for the railway car, a police man lit up his car and blared his horn for Franco. What a treat! We took the railway car to Powell Street, got off, then walked to Union Square. It ain’t Christmas without a family picture in front of the tree. We grabbed another cable car–easily because I’m a local y’all–without waiting in that heinous line full of tourists. 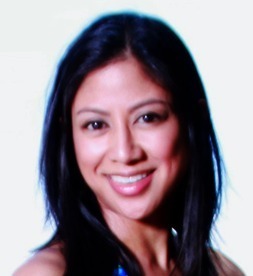 Aren’t there books or concierges that give travelers the inside scoop? You do not have to wait in line for a cable car. Just hop on! Back at the top of Nob Hill, we decided to make one last stop at Grace Cathedral to check out the labyrinth. Grace Cathedral is probably the most famous church in the city. It’s gorgeous. A mob of well-dressed families were spilling out of the church (mass had probably just finished). Franco started running around the labyrinth like all the other kids. 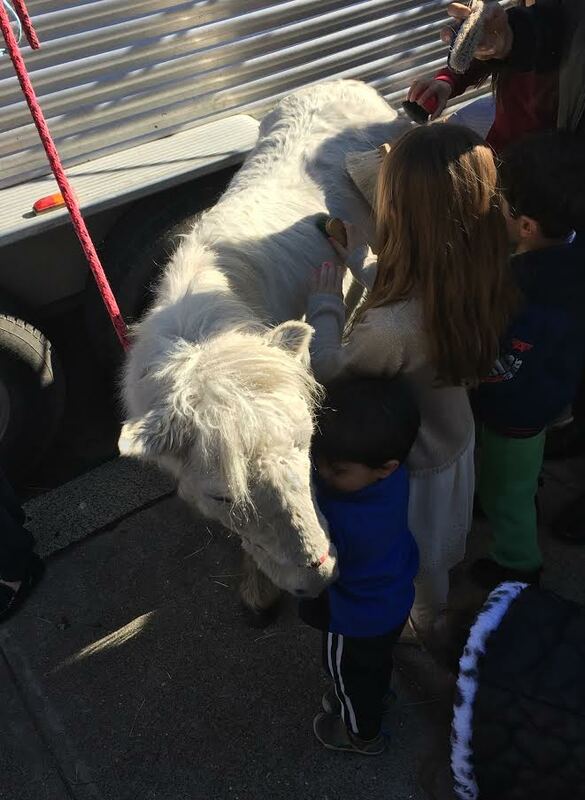 At the bottom of the church, we noticed that there was a petting zoo setup for the kids. Can you imagine the delight? Horses, donkeys, goats, chickens, ducks, and rabbits. 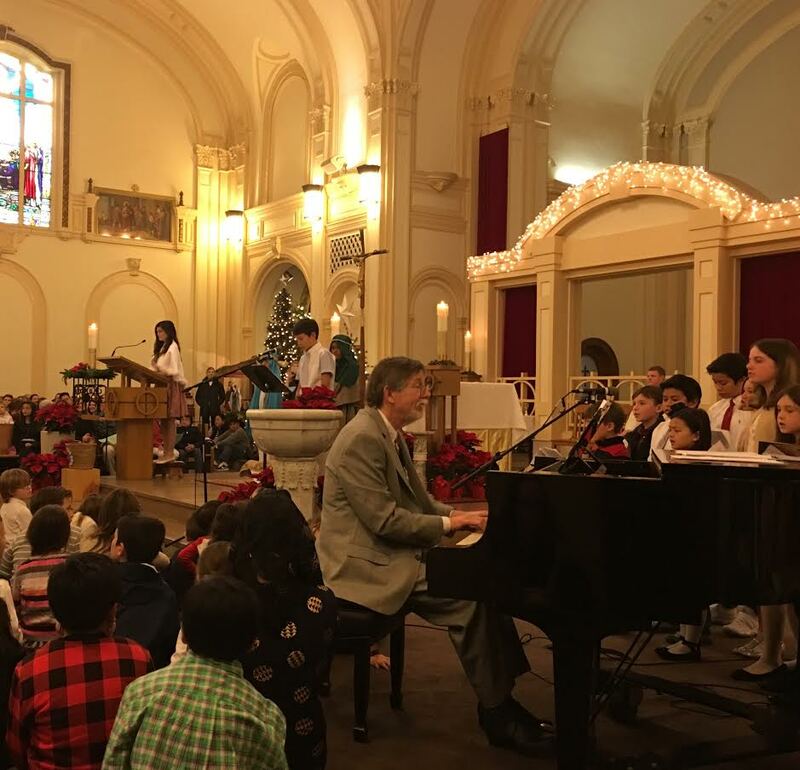 We celebrated the real reason for Christmas at our church St. Joseph’s in Alameda at the 4pm family mass where the kids act out the nativity and sing carols. It’s pretty cute. We got there 30 minutes early, but had to settle for a middle section. I was freaking out about Franco not being able to see, but they asked all the kids to come and sit on the floor up front. Whew! Lastly, we ended the night with Korean BBQ at Bowl’d at the South Shore Shopping Center in Alameda. Our good friend came to meet us and we spent the time making fun of each other, which is always a blast. Wishing you all a wonderful holiday season filled with family and friends, traditions and merriment! 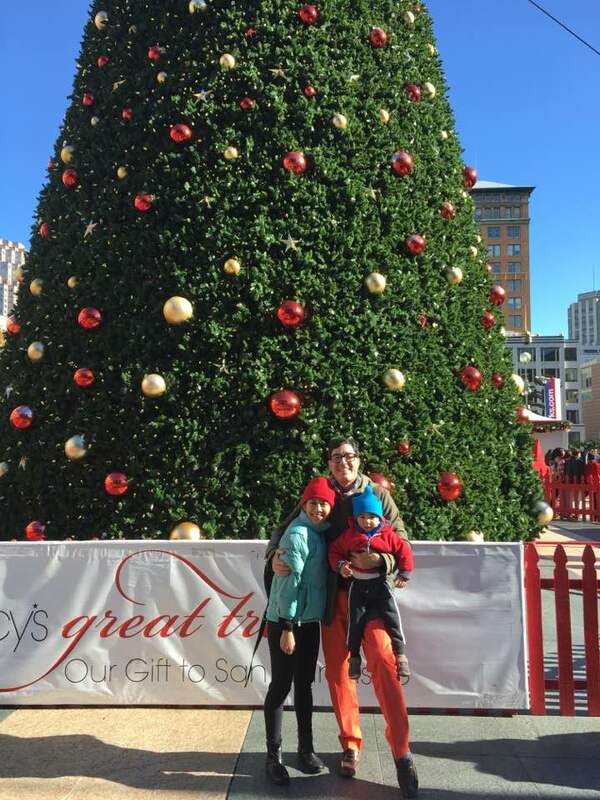 I have had Christmas in NJ for my whole life but I spent two holiday seasons in SF. I loved it. I remember meeting a friend at the Fairmont Hotel. We thought it was magic! Looks like a wonderful Christmas had by all. Hope your New Year’s is great also. 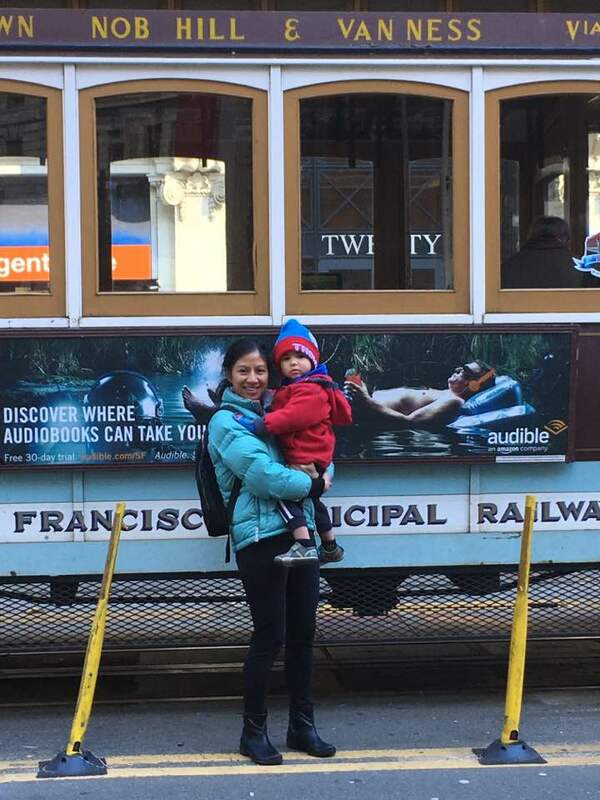 Awww, I absolutely loved reading this 🙂 To see your son’s excitement must have been so wonderful–and glad he enjoyed his first cable car experience! Beautiful pictures and so happy to hear you had a wonderful Christmas! !